What Can You Do With an Old Satellite Receiver? 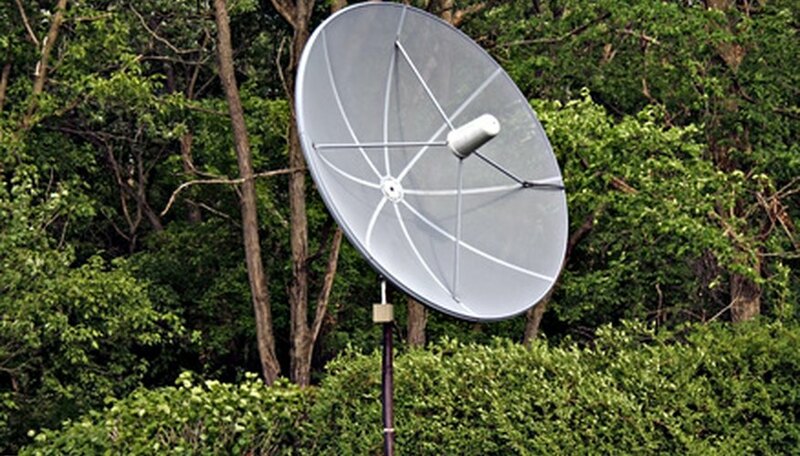 If you have a big old C-Band Satellite Dish in your yard and a defunct receiver, there are a few creative things you can do with them. The electronics are not likely to be usable for their original purpose due to changes in how satellite signals are transmitted. Unless you plan to spend a lot of money upgrading the system, your best bet is to toss the electronics and use the satellite dish for something creative. Glue bits of mirror, stain glass or tiles to turn your dish into a mural, giant logo, star or patriotic symbol. You can also paint the mesh surface to jazz up the look of your old dish and make your yard a statement. Use the dish to make a fish pond. Remove it from the support post and the LNB post and lay it in the spot you want your pond. Mark the outline and scoop out the earth to fit the curve of the dish. Lay the dish in the hole and cover it with plastic sheeting. Toss in some gravel for the bottom, fill it with water, plants and fish and you have an easy to care for water feature for your yard. Put a water pump in the middle and you've got a fountain. Use the support post to hold a bird feeder, yard light or bell post. Because the pole is hollow, you may want to pour concrete into the pole to stiffen it, especially if you hang something heavy like a bell from it. Disassemble the dish into its smallest segments, load the pieces up and take them down to the scrap metal yard to turn into cash. The fiberglass mesh ones probably won't get you much, but the all metal ones may net you a few dollars. A satellite dish flipped over and placed on top of a structure like a gazebo or play house can make a nice cupola. Cover the top with canvas to make a colorful lid or leave it open to let partial sunlight come through. Create a planter by laying a couple of rows of concrete blocks in a circle over dirt. Make the circle's outer edges even with the edges of the dish. Set the dish on top and fill it with soil. Depending on the density of the mesh you may have to lay plastic in the bowl to hold the soil. If you do, poke some holes in the plastic so the soil will drain properly. Plant things in the bowl and water according to the needs of the plants.